I can't honestly remember why I didn't blog about this last September. 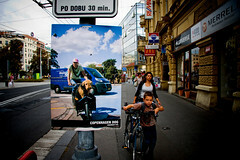 I gave a lecture in the Czech town of Pardubice, in conjunction with an exhibition of photographs. 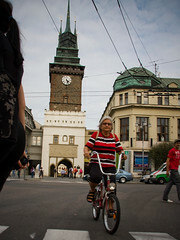 Pardubice is the premier cycling city in the Czech Republic. They enjoy 18% modal share for bicycles. After sitting in a [vaguely] zero-carbon taxi from Prague Airport and seeing few bicycles on the journey to Pardubice, it was like coming home when we rolled across the city limits. Wham!... bicycles everywhere. The lecture was at the City Hall, pictured above. The Mayor and the Danish Ambassador to the Czech Republic were present and it all went smashingly. 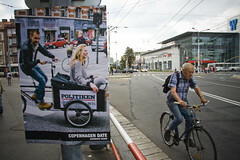 What I was most looking forward to was the street exhibition organised by Vojtech, a Czech who studied in Denmark. 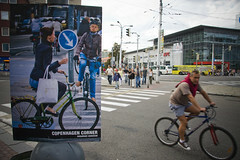 On Pardubice's main drag, posters were placed on all the streetposts, showing off the diversity of Copenhagen's bicycle culture. 30 posters in all. I had forgotten to blog about this but there are several more similar exhibitions coming up in various other cities so I rediscovered these photos in the 'archives'. Here's three of them. Entitled, respectively: Copenhagen Corner, Copenhagen Date, Copenhagen Dog. Pardubice is a lovely little city. Most cities with so many bicycles are. Funny that. I love it when bicycles are parked with the pedal leaning against the curb like in the photo on the left. This is how most bicycles were parked when the cyclist was running errands for decades and decades. When meeting the Mayor he extolled the virtues of the place and it was interesting that he highlighted that the city was famous for its gingerbread and as the birthplace of Semtex. What a contrast. 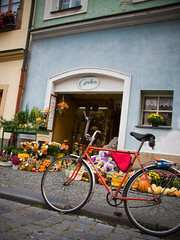 In the Czech spectrum, as well as the regional one, Pardubice is a leader in developing its bicycle culture. Which ain't a bad thing to be famous for. Rest assured, Cycle Chic was present and accounted for, even on a whistlestop trip.